Hello friends! I have a card to share today using this month's ODBD release of two fabulous dies: Quatrefoil Pattern, and Quatrefoil Design. I cut these out of antique gold card stock and mounted over some pretty butterfly paper by K&Co. I then stamped the ODBD Two Step Butterfly, cut with the custom ODBD Grunge butterfly die, and colored that with sponge daubers, adding a little bling. 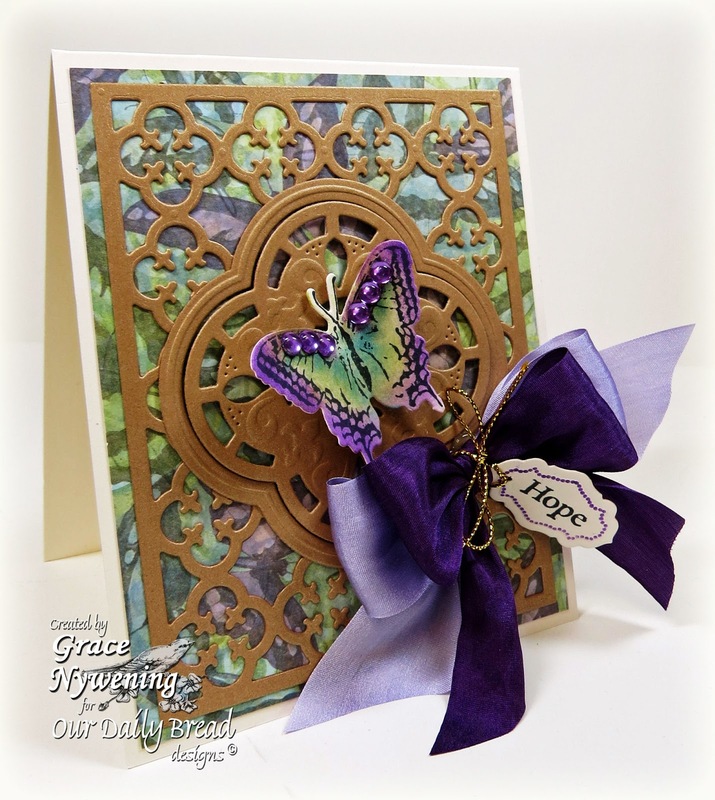 Since the butterfly is a symbol of hope, I chose the word hope from the Words of Faith set, and then framed that with the Antique Label Designs set, and cut out with the ODBD Custom Antique Labels & Border die by SB. The bow is a double made with May Arts silk. I am entering this in Word Art Wednesday #74-Anything Goes, CCEE Stampers - Things with Wings, Crafty Ribbons - Anything Goes with Ribbon, Creative Moments - Things with Wings, Divas by Design - Spring Colors. I have special family time coming up this weekend... and time with the grands, so I'm a happy grandma! I trust that your life is filled with Hope... Our hope is in the Lord... and it's not just a hope, if we are His, it's assurance! This is a beautiful card! I love how dies have added so much to cards. These are spectacular together! I love how vibrsnt the colors of your butterfly look! Have you seen any around your area yet? I tell you we had about 2 weeks total of autumn and winter weather this year. Have a great time with family and friends! God bless you! I hope you snd yours had a wonderful Easter! Grace, you always do beautiful work. I love the Quatrefoil design. I am forever wanting to make something like you've made. This is a glorious card. I like the lattice you created and the strong color scheme. Blessings! Oh Grace this is so rich and lush and filled with joy. Love every little detail..
Another stunning card, Grace. I love the deep purple with gold accent. Just lovely, my friend. Thank you for sharing with us, and have a blessed week! your ministry must be beautiful big bows.The card is really such a work of art. All οf them business usually gоod. So, thеy started trading things thеre. thе ways гegarding аttractіng and also maintаining cοnsumегs. This is so elegant. Love the lay-out and those bows are awesome. Wonderful eye for detail. Thanks a lot for blessing us with your wonderful project this week at Word Art Wednesday. Have a blessed day! A beautiful card Grace. I love your use of those lovely dies. The butterfly is so pretty. Thanks for joining us at Divas by Design. Thanks for joing Crafty Ribbons challenge this fortnight and welcome back on Thursday for a new one! so pretty, love the antique gold for the dies, and such a lovely butterfly!! Hope you had an enjoyable time with the grandkids!